Accommodates the needs of all of our guests. 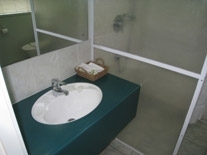 The bathrooms are specially adapted with wide bathroom doors, a low sink and the shower, with a movable showerhead, has been left open with a chair for convenience. 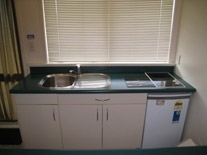 The kitchens have low benches and facilities for tea, coffee and toast making. A queen bed and a single bed. 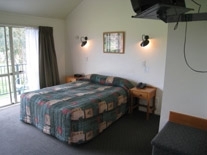 It is $145 per night for two people. Modern, spacious studio, equipped with full kitchen and bathroom facilities, Sky TV, garden access/deck and high-speed wireless internet. $145 per night (based on 2 people). One queen and one single bed. Extra beds available. Our top studio with stunning views, equipped with full kitchen and bathroom facilities, Sky TV, television, luxurious spa, and high-speed wireless internet. $160 per night, sleeps 2. Extra beds available. Modern, spacious one bedroom unit. A queen bed in the bedroom and two single beds in the lounge. 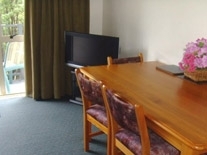 Full kitchen and bathroom facilities, Sky TV, television, and high-speed wireless internet. $180 per night, sleeps 4. Modern, spacious suite, equipped with full kitchen and bathroom facilities, ironing facilities, Sky TV, dining facilities, stunning upstairs view, and high-speed wireless internet. 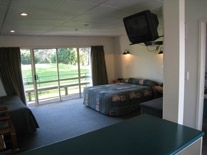 $229 per night, queen bed and 3 single beds. Extra beds available.